Sailor Moon. Card Captor Sakura. Magical Girl Rayearth. They're magical girls, and they're some of the biggest names in manga. Magical girls, ordinary schoolgirls given superpowers, are hugely popular in Japan and the United States. Now Christopher Hart shows fans everywhere how to draw these manga shoujo faves. Faces and body proportions, action poses, costumes, expressions, transformations, special effects--they're all here, all in Hart's distinctive step-by-step approach. So are magical fighting boys and everybody's favorite, the cute, furry manga mascots. Hart demonstrates how to create funny mascots, magical boys, fighting teams, and supporting characters, plus how to design layouts. 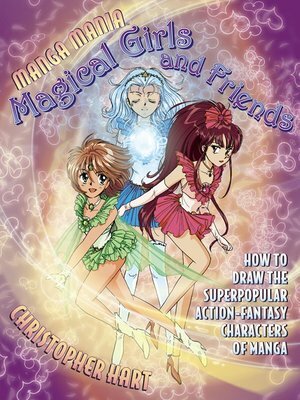 Magical girls show us that we all have special powers deep inside--now Manga Mania: Magical Girls and Friends let those special drawing powers reveal themselves at last!